WYA recognizes the contributions of outstanding individuals for extraordinary defense of the dignity of the human person. Each award is given once a year during one of WYA’s important events. WYA recognizes the importance of the contributions that these individuals have made in the social, political and/or cultural spheres. If you know any individual who deserves this recognition, you may nominate them under the appropriate award. Kathryn Hauwa Hoomkwap was a political leader and social scientist and is remembered for her fearlessness and conviction. Kathryn was born in Shendam, Plateau State, Nigeria, on February 28, 1948, and died on March 16, 2008 in Abuja, Nigeria. In 1979 she was the first female to be appointed Civil Commissioner of Plateau State, and in 1998 she became the first female president of the Christian Health Association of Nigeria. She also served as a member of the 1998 Nigerian Constitution Review Committee, and as Chairperson of the Plateau State board of Internal Revenue. In 1994 Kathryn was named as a member of the Nigerian Government’s delegation to the Cairo Conference on Population and Development. She later served as a member of the Holy See Delegation to various United Nations Conferences in Beijing, Instanbul, New York and Rome. From 2005-2008 she served as member of the International Board of the World Youth Alliance. The World Youth Alliance is honored to present this award in her memory to young people who have demonstrated outstanding service in defense of the dignity of the human person. The Kathryn Hoomkwap Award recognizes distinguished service in defense of the dignity of the human person among WYA members. The Award is presented annually at the WYA Gala. WYA Staff and Alumni are invited to nominate individuals who demonstrate outstanding commitment to WYA’s mission through their work with WYA, or by courageously implementing WYA’s mission in their professional and personal lives. All nominees must have actively participated in WYA programming. 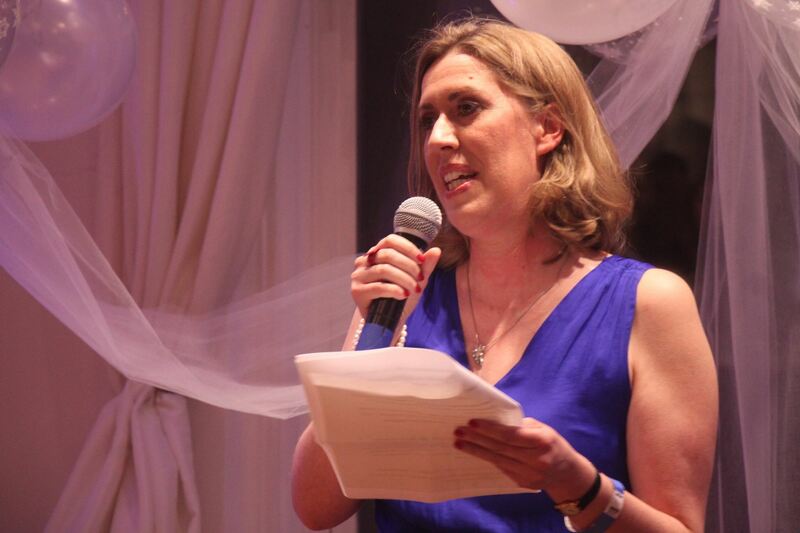 Caroline was the 6th Regional Director for the World Youth Alliance Europe (WYAE) Region and received the fifth WYA Kathryn Hoomkwap Award for Extraordinary Service in Defense of the Dignity of the Human Person at the 2018 WYA Gala. 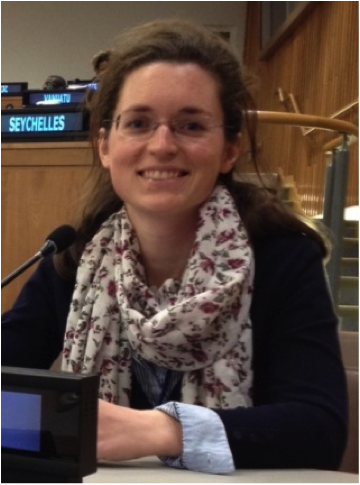 Caroline first became a regional intern in 2012 and helped organize the first Emerging Leaders Conference in Europe. As an intern, she also participated in the International Solidarity Forum hosted by WYA in NY, and the United Nations’ Commission on Population and Development. She fell in love with the WYA training, in particular, the emphasis on understanding and articulating a vision of the human person at the heart of policy and culture. She then served as Regional Director of Operations before becoming Regional Director. During her time with WYA, she helped lay the framework for our successful Down Syndrome Day campaigns, which led to changing EU policy and opening up EU research funding for Down Syndrome. She also contributed towards building our European National Committee structure, which has led to so much growth and expansion of the WYA Europe region today. After working for WYA Europe, she joined a religious order in Spain. Olivia was the first Regional Director of Operations for the World Youth Alliance Europe (WYAE) Region and received the fourth WYA Kathryn Hoomkwap Award for Extraordinary Service in Defense of the Dignity of the Human Person at the 2017 WYA Gala. After her WYA Headquarters internship in 2001, Olivia went to Brussels and helped establish the first WYA Europe office. She served as the Regional Director of Operations for WYA Europe from 2001 to 2005. Olivia has made significant contributions to the WYA Europe region, and continues to demonstrate the highest commitment to the defense and protection of human dignity in every aspect of her life. After working for WYA Europe, Olivia returned to London to train as a child and adolescent psychotherapist. Following her training, she worked as a therapist with children and their families for eight years in inner-city schools. She is currently working in a private Catholic school near London, has a private practice in London and also works as a part-time lay chaplain at SOAS in London. 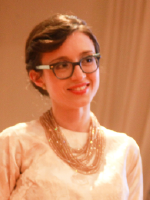 Olivia has remained active with WYA throughout her time since her Brussels days. She helped to set up a London chapter and has served as a member of the WYA International Board since 2014. Erika was the first Regional Director for the World Youth Alliance Asia Pacific (WYAAP) Region and received the Kathryn Hoomkwap Award for Extraordinary Service in Defense of the Dignity of the Human Person at the 2016 Gala. After her WYA HQ internship in 2003, Erika went back to her hometown, Manila, and established the first WYAAP office. She served as the Regional Director for WYAAP from 2004 to 2007. Erika has made significant contributions to WYAAP Region, and continues to demonstrate the highest commitment to the defense and protection of human dignity in every aspect of her life. From her work at WYA, and after further studies in International Business and Marketing from the University of Berkley, CA., she has gone on to embody this mission and vision in her work with the people of the Philippines, particularly the most vulnerable and marginalized communities. She is currently a Director in xchange, an incubator for early stage social enterprises. xchange helps local enterprises scale and reach sustainability in the shortest time possible. She works tirelessly to bring her talents to bear with the underprivileged in the Philippines, so that together they can work to build stronger individuals, families, communities, and a nation that respects the latents that each person brings to bear. Maria has served as WYA staff since 2003, and received the fifth WYA Kathryn Hoomkwap Award for Extraordinary Service in Defense of the Dignity of the Human Person at the 2015 WYA Gala for her longstanding service to the World Youth Alliance and its mission. Born in Munich and raised in Rome, Maria first encountered the World Youth Alliance in 2000, during her participation in the Beijing +5 proceedings at the United Nations. In 2001, she was awarded a scholarship tour of Medieval Italy, to study the writings of Dante Alighieri and Italian Renaissance Art. She graduated from Fordham University, New York, in 2002 with a BA in Philosophy and Italian. She taught honors Italian and the History of Western Art at the Montfort Academy for boys in Katonah, New York, for three years. Maria has traveled extensively through Europe with her family and her husband, Christopher. She has studied French, Spanish and Latin, and is fluent in Italian. Maria joined the WYA staff at the WYA Headquarters in New York in in 2003, and became Director of Development in 2005. She continues to serve in this capacity at the WYA Foundation, where she works with WYA Alumni, friends, and donors, to grow programming support for the World Youth Alliance and its global work. Aliah was the first awardee of the WYA Kathryn Hoomkwap Award for Extraordinary Service in Defense of the Dignity of the Human Person because of her firm conviction and courageous defense on behalf of human dignity. After volunteering for World Youth Alliance Asia Pacific in 2005, Aliah joined the New York Internship at the World Youth Alliance Headquarters in 2008, and became the International Director of Operations from 2008 to 2010. She served briefly as the Executive Director of WYA Foundation before returning to the Philippines to assume her elected position as the 2nd District Representative of the Province of Lanao del Norte in the Philippines House of Representatives. While in office, she presented a new voice in Congress for the indigenous Maranao tribe and fought the Reproductive Health Bill. Throughout her work, Aliah diligently upheld the WYA mission in solidarity with young people around the world through her efforts in policy-making and various humanitarian initiatives. She is a shining example of a young WYA leader, dedicated to the work of human dignity. Aliah continues to serve the mission of the World Youth Alliance as a member of the WYA Board of Directors. The Mary R. Smith Award is the World Youth Alliance (WYA) award for distinguished service to the mission of the WYA. Mary R. Smith was an early and important supporter of WYA’s mission, and along with her family provided critical support and encouragement that was essential to WYA’s early growth and development. This award honors her legacy, and acknowledges those who follow her in extraordinary support of our efforts through their generosity and their professional contributions. Mary Rutter Smith was born on January 8, 1920 in New York City. In 1941 she enlisted in the U.S. Navy where she met and married Kennedy Smith. They raised their six children in Pittsburgh, while summering in Sherwood, MD. It was there in 2001 that Mary R. Smith first met Anna Halpine and the World Youth Alliance, and became a beloved and important supporter for the mission and projects of WYA. Mary Rutter Smith died in 2003. Following her mother’s death, her daughter, Ann Seabright, became increasingly involved in WYA’s early work, traveling to New York to help establish the first governance structures for the organization, and joining as Chair of the WYA Board of Directors in 2005. She continues to honor her mother’s legacy with her husband Tom and their ten children, through their personal and philanthropic support of WYA. The Mary R. Smith Award was established in 2013 to honor the legacy of Mary Rutter Smith, whom we affectionately remember as ‘Mamoo’. The award recognizes outstanding contributors to the work of WYA, and is presented annually at the WYA Dinner in New York. Honorees have demonstrated long-standing commitment to the values and mission of WYA, and have personally contributed to its growth through generous involvement and support. Vincenzina (“Vinnie”) Santoro is an international economist having initiated her career as economist with the Federal Reserve Bank of New York. She is a former Vice President and economist of JP Morgan and Co. where she worked for 27 years in the economics department, foreign exchange department and the Bank’s Milan office where she established an economic research unit. Since leaving the Bank, she worked briefly at the United Nations in the Department of Economic and Social Affairs (DESA). She has been an economic consultant to various foreign trade and investment entities, represents the American Family Association of New York at the United Nations and writes frequently about international economic and social issues for a number of publications including Human Life Review, MercatorNet and Catholic World Report. She has been a volunteer since 9/11 at the Charity Accountability Program of the New York Better Business Bureau, monitoring charities and non-profits. Ms. Santoro is a co-author of the recently published Family Capital and the Sustainable Development Goals. A native New Yorker and graduate of Hunter College, City University of New York (BA, MA in economics), Ms. Santoro is fluent in five languages. Lewis E. Lehrman has written widely about economic and monetary policy. Lehrman has written about economics in publications such as Harper’s, The Washington Post, The New York Times, The Wall Street Journal, The Weekly Standard, Crisis, Policy Review and National Review. His writings about monetary economics earned him an appointment by President Ronald Reagan to the Presidential Gold Commission in 1981. Along with Congressman Ron Paul, Lewis Lehrman collaborated on a minority report of the Commission, which was published as The Case for Gold (1982). Lehrman has been named to the advisory board of the American Principles Project’s Gold Standard 2012 initiative. He also heads the Gold Standard Now, a project of The Lehrman Institute, a public policy foundation that he founded in 1972. Born in Harrisburg, Pennsylvania, August 15, 1938, he received his Bachelor of Arts degree at Yale University in 1960, after which he won a Carnegie Teaching Fellowship as an instructor on the Yale faculty. Subsequently, he received his master’s degree as a Woodrow Wilson Fellow from Harvard University. He chaired the Yale University Humanities Council. He was a recipient of the 2005 National Humanities Medal at the White House for his scholarly contributions, and in 2010, he received the William E. Simon Prize for Lifetime Achievement in Social Entrepreneurship. He also has been awarded Honorary Degrees from Babson College (Babson Park, MA), Gettysburg College (Gettysburg, PA), Lincoln College (Lincoln, IL), Marymount University (Arlington, VA) and Thomas Aquinas College (Santa Paula, CA). In 1980, Lehrman was inducted into the Babson College’s Academy of Distinguished Entrepreneurs. Lehrman is presently senior partner of L. E. Lehrman & Co., an investment firm he established. In April of 1987, Lehrman joined Morgan Stanley & Company, investment bankers, as a Senior Advisor and a Director of Morgan Stanley Asset Management, and in 1988 became a Managing Director of the firm. He is a trustee of the New-York Historical Society, and has been a trustee of the American Enterprise Institute, NAACP Legal Defense Fund, the Manhattan Institute, the Morgan Library, and the Heritage Foundation among other groups. Lewis and Louise Lehrman have five children and thirteen grandchildren. 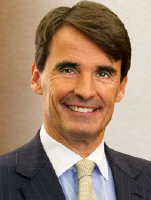 Jean-Baptiste de Franssu is Chairman of INCIPIT, an M&A advisory and consulting firm. He is formerly CEO of Invesco Europe, and a member of the Invesco Worldwide Management Committee. Prior to joining Invesco, he was the Director of Groupe Caisse de Dépôts et Consignations in France. A graduate of the ESC Group Business School in Reims, France he holds a BA in European Business Administration from Middlesex University in the UK and a postgraduate degree in Actuarial Studies from Pierre and Marie Curie University in Paris. He is the former Vice-President and President of the European Fund and Asset Management Association (EFAMA) and Non-executive Director of TAGES LLP and Carmignac Gestion. He is also a board member of various charities in Europe and the United States. Jean-Baptiste is married to Hélène de Gerlache de Gomery and they have four children. Jean-Baptiste de Franssu serves on the Board of Directors of the World Youth Alliance. 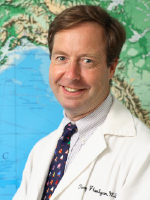 Dr. Timothy P. Flanigan is the Chief of the Division of Infectious Diseases of the Department of Medicine at Brown University. At the Miriam Hospital Immunology Center he provides comprehensive HIV care and participates in clinical care and research at the Rhode Island Prison. Dr. Flanigan has been principal investigator on two prevention grants: CDC Project Start, to develop HIV and STD intervention for young men leaving prison, and the SAMHSA funded Project Shield, to develop group HIV and STD intervention among substance abusing adolescents. He is the principal investigator of the Brown University NIH AIDS Clinical Trials Unit and a training grant from the National Institute of Drug Abuse on diagnosis, prevention, and treatment of HIV and other infectious consequences of substance abuse. He is an associate director of the Brown University Fogarty Program to train and mentor overseas investigators in the areas of HIV, AIDS and opportunistic infections. He is also principle investigator of an NIH R01 grant (DA013767-02) designed to study the effectiveness of once daily directly observed antiretroviral therapy (DOT) for the treatment of hard-to-reach populations. He is married and has five children. Dr. Flanigan serves on the Board of Directors of the World Youth Alliance. Biographer of St. Pope John Paul II; Fellow, Ethics and Public Policy Center, Washington DC. 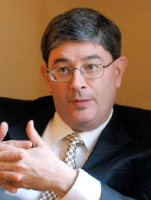 George Weigel, Distinguished Senior Fellow of the Ethics and Public Policy Center, is a Catholic theologian and one of America’s leading public intellectuals. He holds EPPC‘s William E. Simon Chair in Catholic Studies. Mr. Weigel is the author or editor of over twenty books, including The End and the Beginning: Pope John Paul II –The Victory of Freedom, the Last Years, the Legacy (Doubleday, 2010); Practicing Catholic: Essays Historical, Literary, Sporting, and Eligiac (Crossroad, 2012); and Evangelical Catholicism: Deep Reform in the 21st-Century Church (Basic, 2013). He has written essays, op-ed columns, and reviews for major opinion journals and newspapers across the United States. A frequent guest on television and radio, he is also a Vatican analyst for NBC News. His weekly column, “The Catholic Difference,” is syndicated to sixty newspapers. From 1989 through June 1996, Mr. Weigel was the president of the Ethics and Public Policy Center, where he led a wide-ranging ecumenical and inter-religious program of research and publication on foreign and domestic policy issues. From June 1996, as a Senior Fellow, Mr. Weigel prepared a major study of the life, thought, and action of Pope John Paul II. Witness to Hope: The Biography of Pope John Paul II was published to international acclaim in the fall of 1999, and has since been translated into twelve languages, with a Chinese edition currently in progress. Mr. Weigel received a B.A. from St. Mary’s Seminary and University in Baltimore and an M.A. from the University of St. Michael’s College, Toronto. Mr. Weigel serves on the Board of Advisors of the World Youth Alliance. The Freedom for Excellence Award is a World Youth Alliance Asia Pacific (WYAAP) award given to a WYA member with exemplary service and dedication to the growth of WYA. “Freedom for excellence” is a concept introduced to us by St. Thomas Aquinas and Mr. George Weigel. This type of freedom stems from the principle of pursuing what is objectively good. It affirms the depth of human nature in terms of how we human beings strive for an objective truth and of how we live each day towards the direction of what is good for ourselves and for others. WYAAP promotes this freedom to exercise one’s intelligence and one’s will in order to achieve truth, goodness, and happiness. As WYA members, we constantly affirm that the human person is valuable and is worthy of respect and love. Hence, this principled freedom allows us to frame our understanding of freedom according to our core belief on human dignity. More importantly, it guides us that we may be able to set a good example to others outside the WYA community in order for them to understand the joy of being men and women for others. The Freedom for Excellence Award was established in 2015 to honour individuals who have left a legacy of excellence in contributing to the growth of World Youth Alliance. The award recognizes individuals who have pursued praiseworthy efforts in heightening the growth of WYA and in pursuing its mission to promote human dignity. 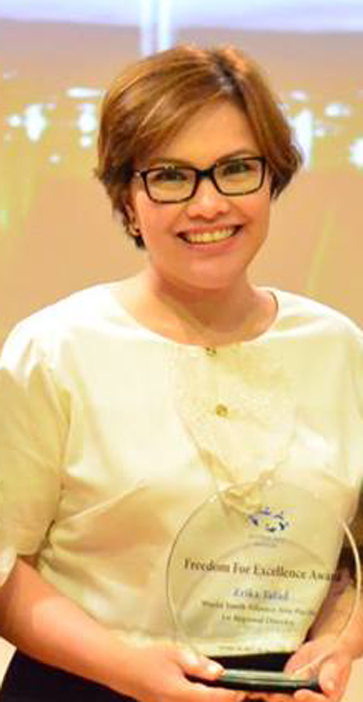 The 1st recipient of the Freedom for Excellence Award is Ms. Erika Tatad, WYAAP’s 1st Regional Director. Erika joined the World Youth Alliance as an intern in the New York head office in 2003. Soon after, she was appointed Regional Director of Asia Pacific and set up the office in Manila, Philippines. In the four years she spent in the region, Erika led the development of the National Committee. She spread the word about WYA throughout communities in China, India, Singapore, Thailand and Australia, which led to the growth in membership in Asia Pacific. Since her time with WYA, she has been a part of other groups that promote the dignity of the human person. She previously served as Managing Director of Hapinoy, a Filipino social enterprise that works with women micro-entrepreneurs to grow their small village shops (“sari-sari stores”) through training and education, access to capital, and new business opportunities. Currently, she is a part of Exchange, a Filipino impact investment group for social enterprises. Erika completed International Diploma Programs in Global Business Management and Marketing from UC Berkeley, as well as an internship with World of Good, a leading US-based social enterprise now with the eBay group. 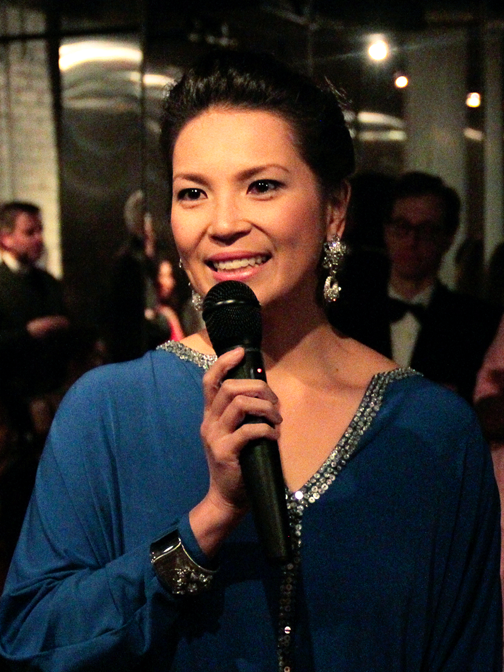 She is one of the Asia Society’s Asia 21 Philippine Fellows, Class of 2010 and a member of the World Youth Alliance Alumni. The Viktor Frankl Award is a World Youth Alliance Award that recognizes WYA members who have pursued praiseworthy efforts in heightening the growth of WYA and in pursuing its mission to promote human dignity. The Award was launched in 2017 in celebration of WYA’s 18 year anniversary. Click here to read the stories of the 2017 Awardees. Click here to read the stories of the 2018 Awardees. Each regional office is run by two staff members. The Foundation provides general support for WYA.